When you’re a child and a 20-something, you dream of doing many things during your life. Although you don’t formally label it a bucket list — or a lifetime goal — that’s what it is. What childhood and early adult dreams have you accomplished so far? How did they work out? Some great bucket list resources are available online at http://bucketlistjourney.net/2011/07/45-inspiring-bucket-lists-that-i-stalk/. 1) Dream: Be a teacher. Taught several college classes while I was working as a bank manager and during the years I was a stay-at-home mom. Was also a corporate trainer for a short time. Reality: Teaching was a lot harder than anticipated. One college class was held at 6 p.m. for working adults and lasted four hours. Even I didn’t want to hear myself talk for that long – but it was entertaining watching the students’ eyes roll back in their heads. 3) Dream: Become a newspaper reporter. In my current job, I’ve been the editor of the organization’s employee newsletter for eight years and love it. Also co-wrote a weekly newspaper column in the local newspaper for two years with the friend who co-wrote the paperback book with me. Reality: Fun! 4) Dream: Work with computers. Have taught computer training courses, been a self-taught web developer and now a big blogger (at work and at home). Reality: Fun. 5) Dream: Get married. Reality: It didn’t work out that well. 6) Dream: Have a child. Reality: It worked out very well! Have a wonderful son. 7) Dream: Travel to Europe. Went for a six-week trip during one high school summer, taking French classes in the mornings and sight-seeing in the afternoons. While there, we saw naked people in the play “Hair.” Reality: Fun! 9) Dream: Get a master’s degree. Reality: When I quit college to get married, it was sort of touch-and-go for a while, but I did it! 10) Dream: Travel to other continents. Reality: Took a cruise several years ago that started in Sydney, Australia, and went to Bora Bora and the nearby islands and ended in Hawaii. That was very, very cool — a trip of a lifetime! Also spent six weeks abroad in high school. 11) Dream: See the Western U.S. Reality: Took a tour several years ago and visited the Grand Canyon and several other famous national parks. It was great. 12) Dream: See California. Reality: Took a trip last year and went to San Francisco (my very favorite town now next to Charleston, S.C.), San Diego and a few other nearby towns. Very fun. 13) Dream: Take a cruise. Reality: Have been lucky enough to take more than 13 cruises so far! It’s my favorite way to vacation. 14) Dream: Have crutches. That’s an odd goal for a kid, I realize, but it seemed glamorous and exciting. Reality: It really bites! Eight years ago, I broke my foot and had a cast, crutches and a wheelchair for four months during the heat of a South Carolina summer. Not fun. At all. 15) Dream: Use one of those poles with a nail on the end to pick up trash along the road. (Another odd childhood goal.) Reality: Volunteered at work last year to do a road clean-up on a Saturday morning and thought the big day had finally come, but they ran out of the sticks before they got to me. Instead, I bent over a whole lot and ended up with a bunch of mosquito bites and a backache the next day… Maybe next time! 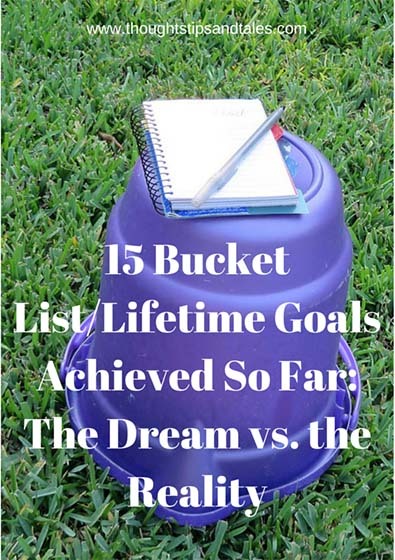 How has the reality turned out for bucket list goals you’ve met? This entry was posted in accomplishments, blogging, bucket list, childhood, family, favorites, fun, goals, life, memories, thoughts tips and tales and tagged accomplishments, achievements, bucket list, fun, goals, life, lifetime goals, memories, thoughts tips and tales. Bookmark the permalink. Really? You wish for a stick to pick up roadside trash? I didn’t want to own one of those sticks – I just wanted to use one to pick up trash on the ground. Remember…I was a kid…and it seemed like a fun thing to do at the time…. Great list and fun perspective!! I should make my own. 🙂 Thank you for linking up at Thoughtful Thursday! Starla J @ Pressing In and Pressing On recently posted…It’s Back to School Week. Thanks for hosting Thoughtful Thursday!